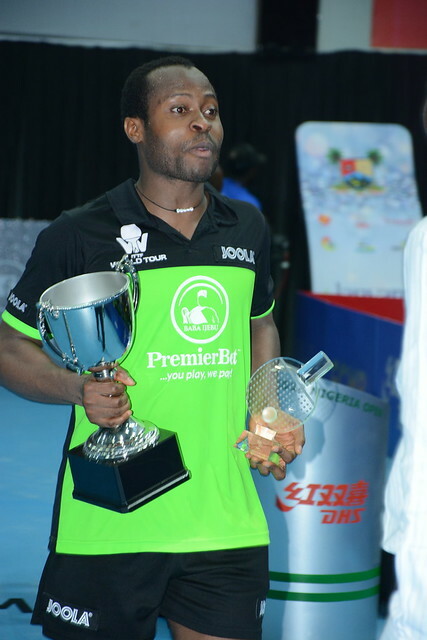 Powerful, Khalid Assar is the player very much charged with not only upholding the honour of his nation but also that of his family at the 2018 ITTF Challenge Seamaster Nigeria Open; elder brother Omar, the defending Men’s Singles champion is not competing. Currently based in Denmark; alongside Mohamed El-Beiali, he is very much leads Egypt’s quest for honours at the five day event which commenced with qualification on Wednesday 8th August. Mohamed El-Beiali is the no.11 seed in the Men’s Singles competition, Khalid Assar in the no.30 seed but if he is to repeat the success of two years ago when he reached the final, losing to Finland’s Benedek Olah, he may well have to cause a major shock and break the hearts of the host nation. Should matters proceed according to plan Khalid Assar is scheduled to meet Nigeria’s Quadri Aruna, the top seed in round two; for Mohamed El-Beiali, the potential second round Men’s Singles opponent is also from the host nation. Kazeem Nasiru, the no.26 seed, lies in wait. Contenders no doubt for honours but somewhat outsiders; it is not the situation in the Men’s Doubles event where they join forces. They are the top seeds. The quest yet to start for Khalid Assar and Mohamed El-Beiali; in the Men’s Singles event for their colleagues, Mahmoud Helmy and Ziad Wael it has already started and with success. In their opening contests Mahmoud Helmy beat Nigeria’s Akeem Lasisi (11-9, 11-6, 11-6, 11-5); Joseph Osedunkwu received a walk-over when due to face Joseph Osedunkwu also from the host nation.